I can't believe today is the last day of 2016! 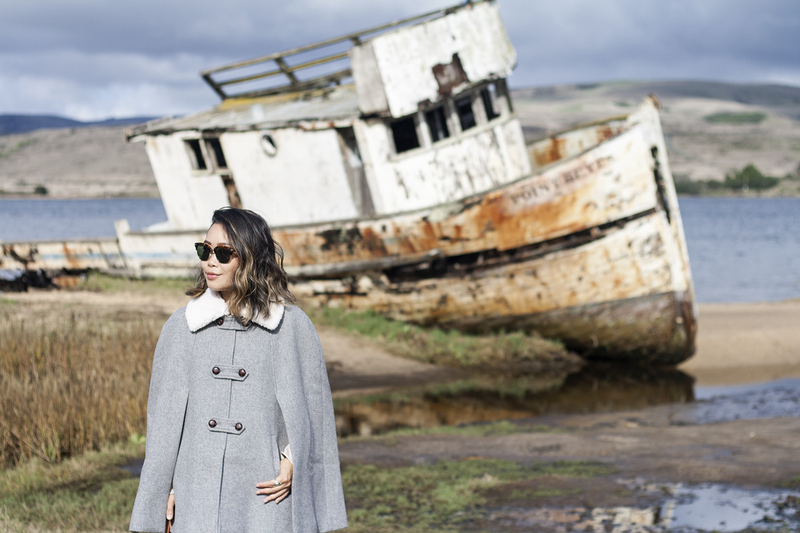 I am beyond excited that this year has come to an end... To celebrate, I am sharing with you a San Francisco city guide I created in collaboration with Agent Provocateur. 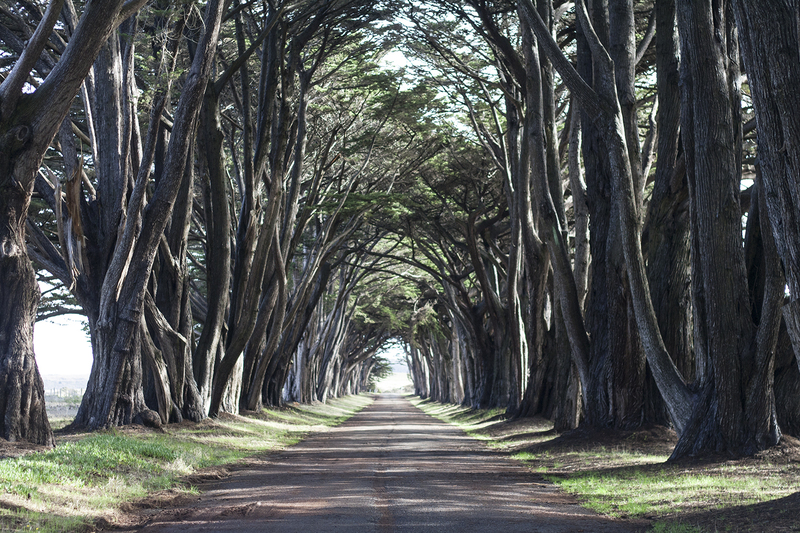 I have lived in the Bay Area for 20 years and below are some of my favorite spots of 2016. 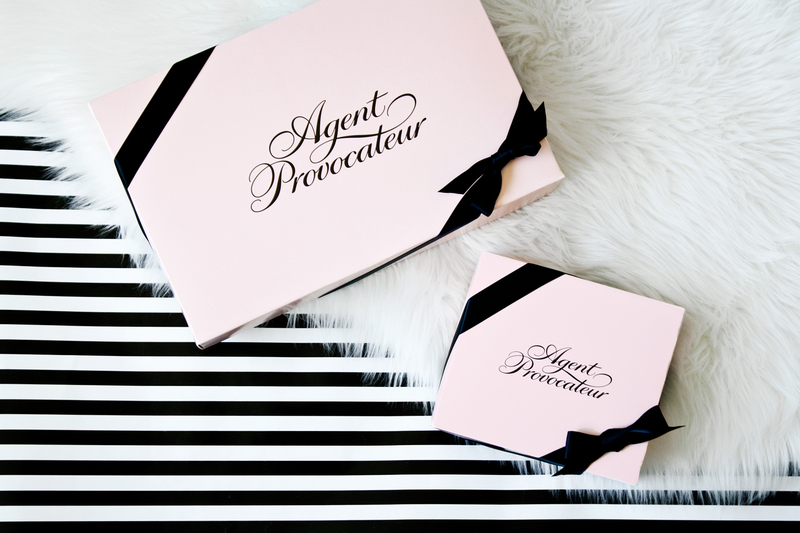 Besides the beautiful Agent Provocateur store located on Geary in the heart of Union Square, there are many amazing places to visit, from restaurants to museums to outdoor adventures! Read on and I hope you get a chance to check them out if you haven't already! Start your morning with brunch at Cafe Réveille over in Mission Bay. I love their matcha latte and mushroom hash. Not only is the food amazing, the decor is top notch as well. I mean, darling little pink tables outside and cute bar tiles inside. Need I say more? Spending an afternoon at SFMOMA is a no-brainer. The modern art museum went through a major makeover last year and it is phenomenal! I am (strangely) fascinated by all the aesthetically pleasing stairs and of course, the art! Enjoy permanent pieces from Wayne Thiebaud (my absolute favorite painter of all time), Andy Warhol, Rothko, etc. and explore exciting new exhibitions. Whether you are a fan of painting, photography, sculpture or media, there is something for everyone! 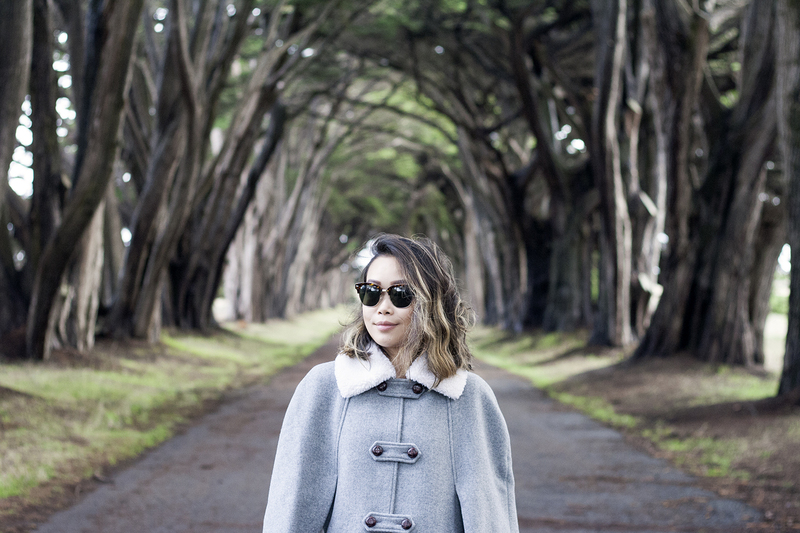 Golden Gate Park has a lot to offer but the Conservatory of Flowers is definitely the prettiest of them all! From the outside, the structure is all white and kind of majestic. On the inside, it is all green and a bit like paradise. 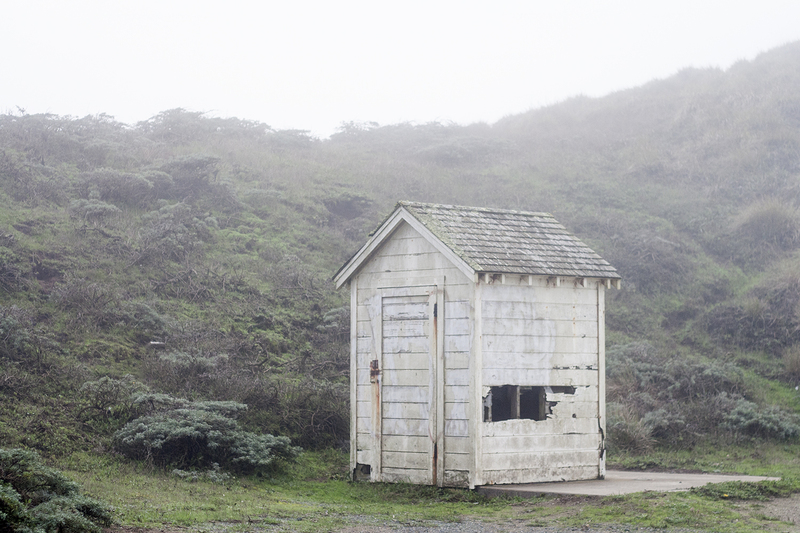 If you feel like escaping the hustle and bustle of the city, Marin Headlands is just a Golden Gate Bridge away. There are plenty of hiking trails and the views are absolutely breathtaking! 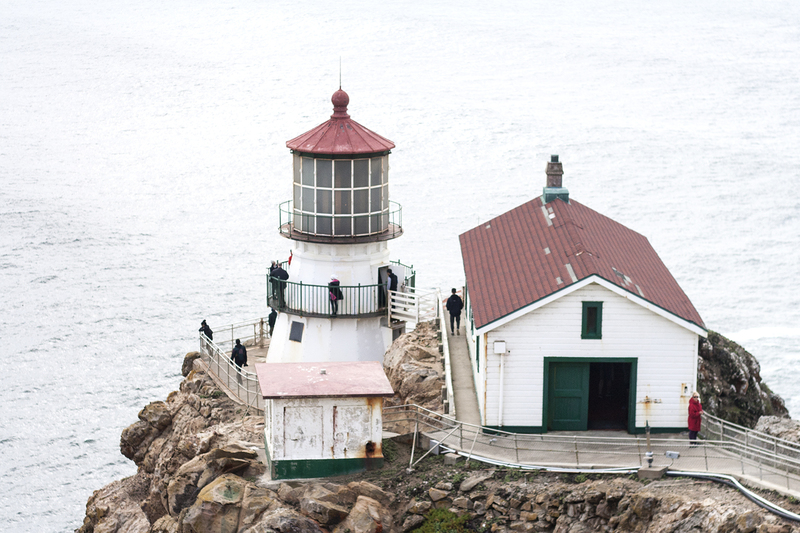 Many people only go as far as Battery Spencer (it is rather touristy actually) but the hidden gem is Point Bonita Lighthouse. This is the place I take all my friends visiting from afar! I can't even explain how beautiful it is, you just have to go and see it yourself! First of all, I must admit that I actually have not tasted the oysters at Leo's. Sorry, I am just not a fan of oysters (I do eat all other seafood and shellfish though). If you love oysters, I heard they are exquisite! The food I did eat... foie gras, ahi tuna confit, hamachi, braised short ribs... were all very tasty. They also have good drinks as well! Last but not least, shall we clap for the decor? 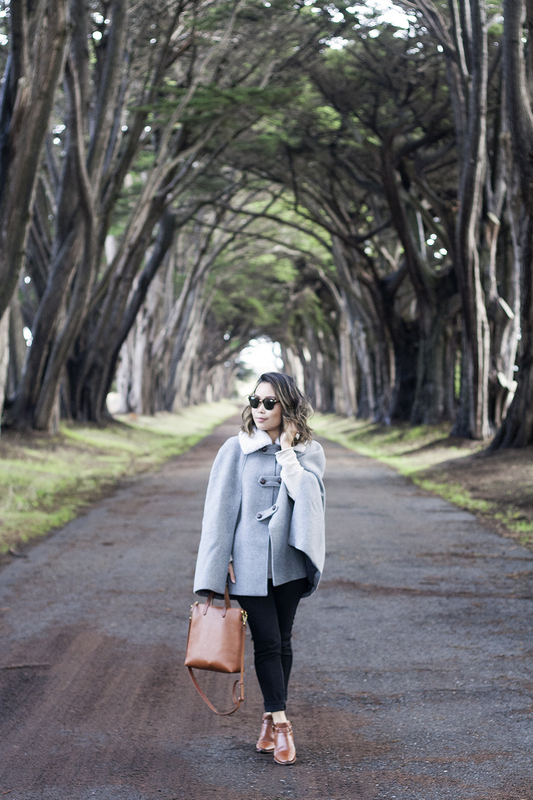 I hope you enjoyed this mini city guide of San Francisco. Have a very happy new year! Merry Christmas, everyone! I am currently in Seattle, writing this blog post... Flash back to a few days ago when my good friend Ally and I drove around town looking for cute decorated houses to take photos with, and we came across this darling little house in Bernal Heights! Coincidentally, it matched my neutral/pastel outfit perfectly! 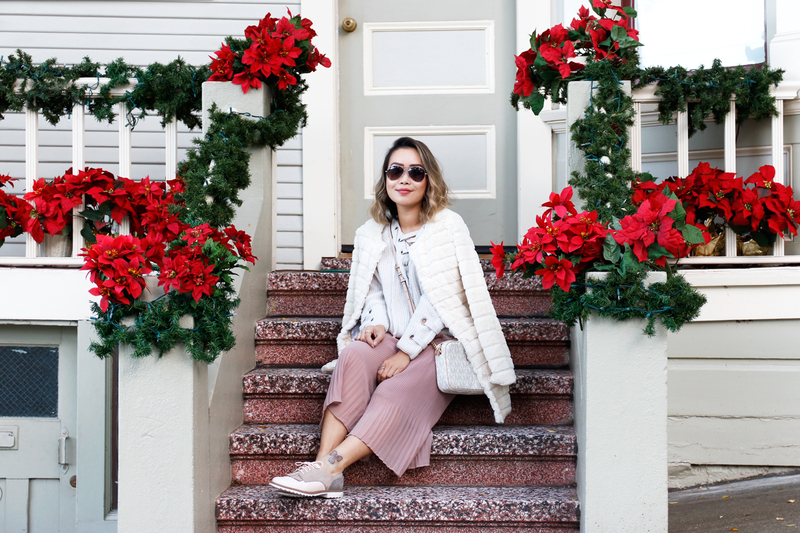 Faux fur coat, oversized sweater with laced details, pleated chiffon culottes, colorblock loafers, and my cute Jet set crossbody bag by Michael Kors! Wishing you all a wonderful holiday! Jet set large crossbody by Michael Kors. 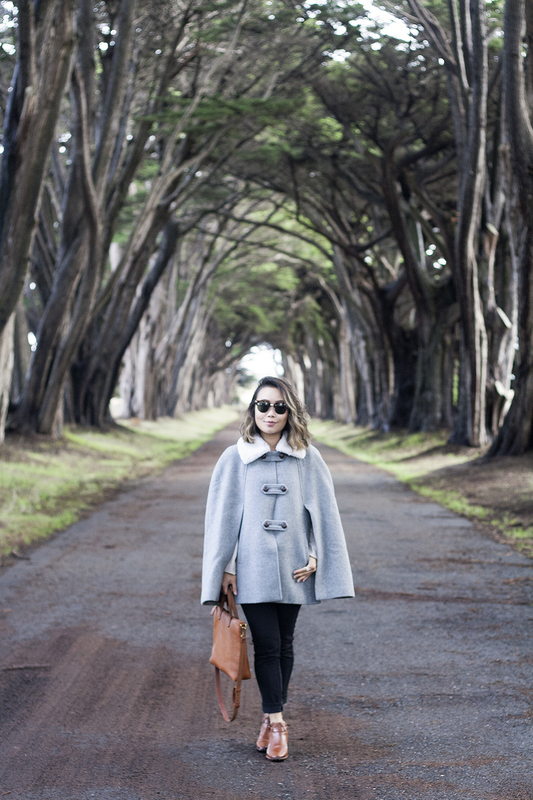 Oversized sweater with laced details c/o Choies. Pleated chiffon culottes from Boohoo. Colorblock fringed oxfords c/o Clarks. Trends come and go... and as I get older I understand this concept more. 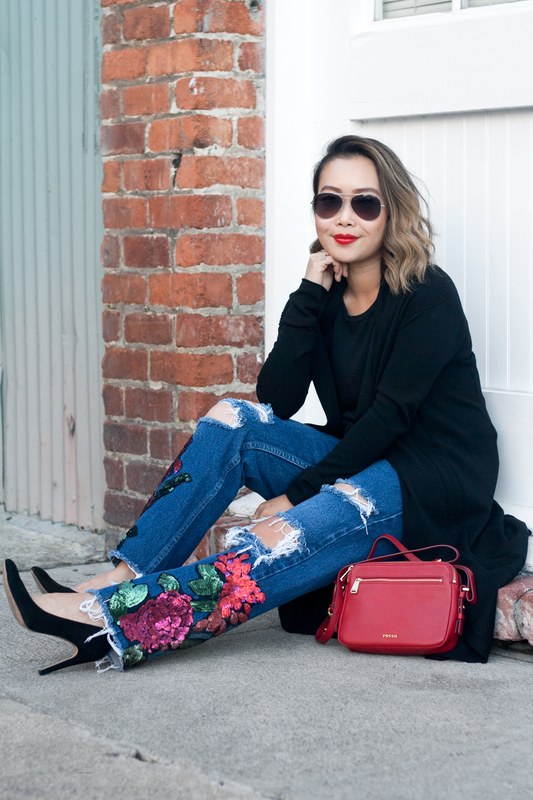 I used to spend so much on pieces that have no value, pieces that I would only wear for a season, and then they are abandoned in the back of my closet. Now, I like to invest in classic pieces that are timeless. When it comes to accessories, watches are a must have. 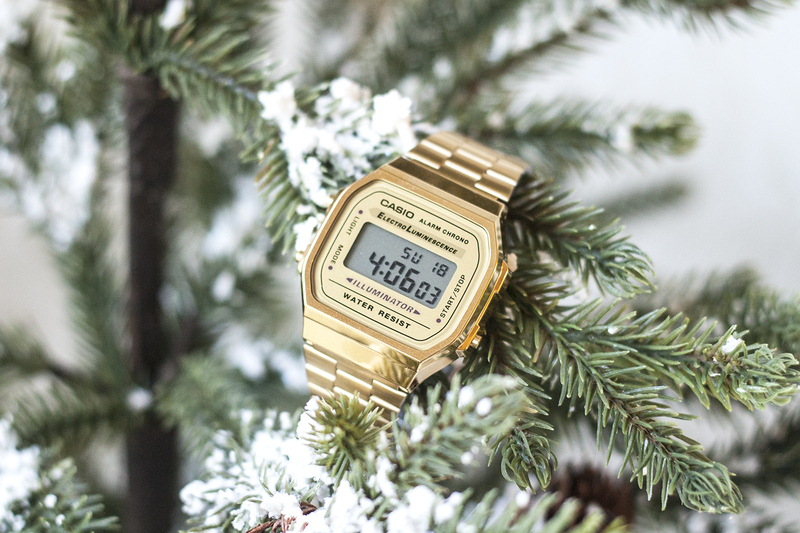 Casio's vintage collection will never go out of style. This watch features gold plated design, stainless steel, digital movement, and fold-over clasp fastening. It is water resistant to 30 meters, meaning that it will withstand splashes of water or rain but should not be worn while swimming or diving. 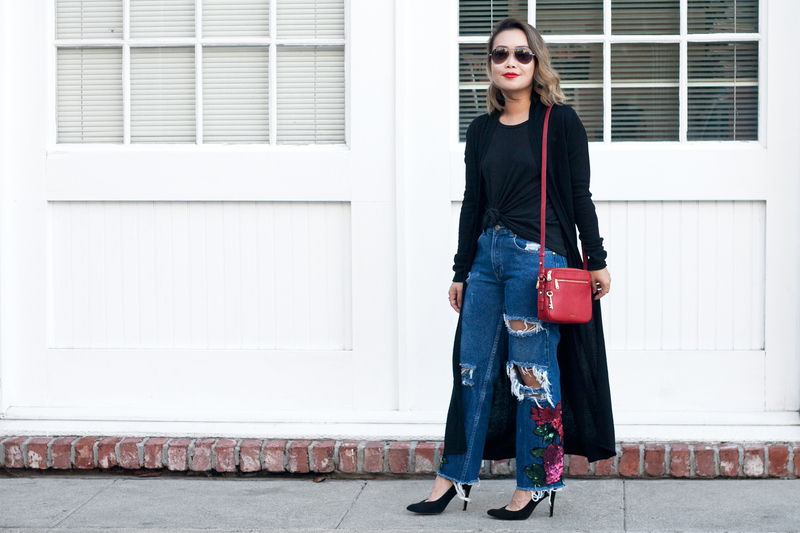 I also love that you can dress it up for a night out or dress it down for everyday wear. 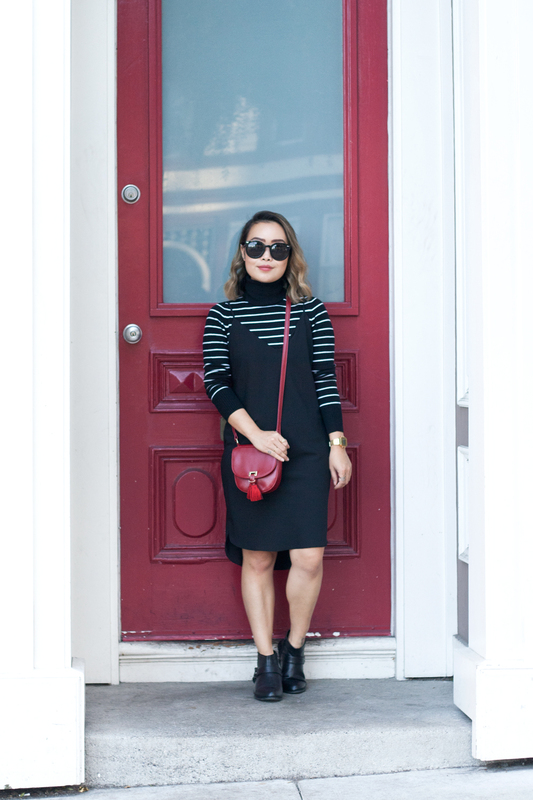 Here, I am keeping it casual with a striped turtleneck sweater and a simple slip dress. 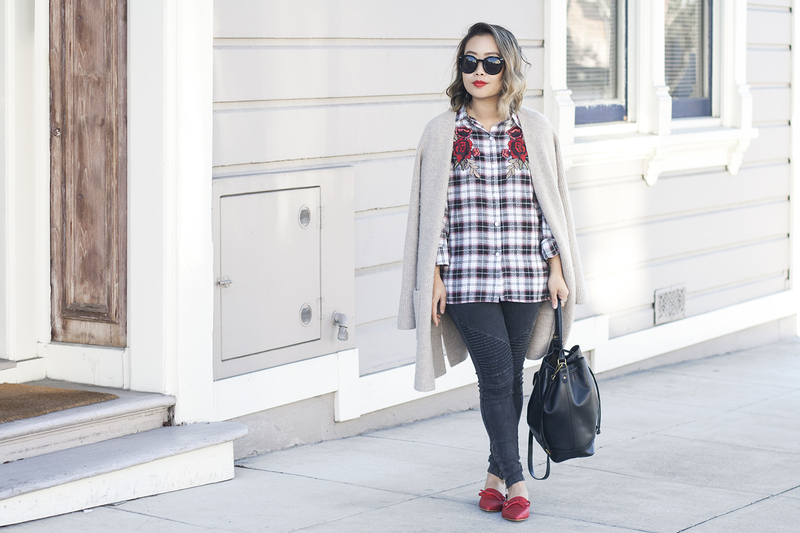 And of course I had to carry a little red bag to match the red door! Have you done all your Christmas shopping yet? 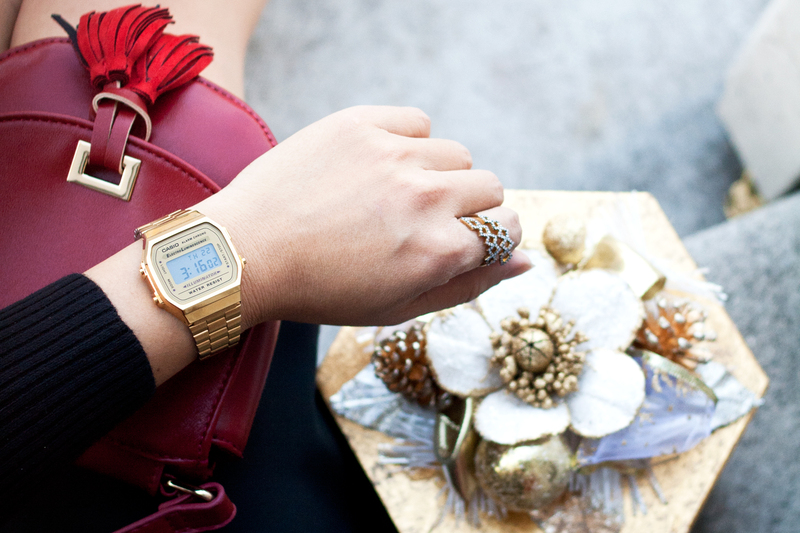 If not, Casio vintage timepieces make the perfect gift, whether it is for your mom, your bff, or your significant other. Worry it won't ship in time? Problem solved! 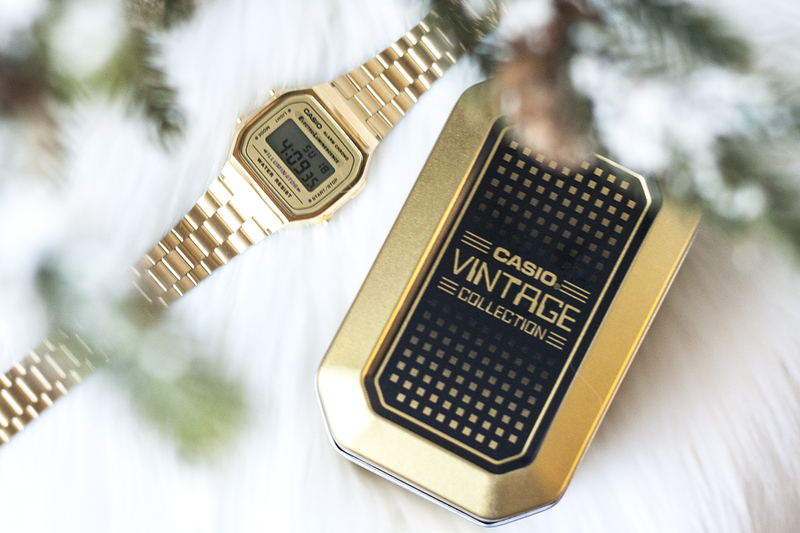 You can actually check out Casio’s full vintage collection at Bloomingdale’s Union Square and surprise your loved ones with one of their vintage timepieces this holiday season! Lastly, follow @casio_us on Instagram for more updates. Classic A168WG-9VT watch c/o Casio. Striped turtleneck sweater by French Connection. Strappy slipdress by Amanda Uprichard. 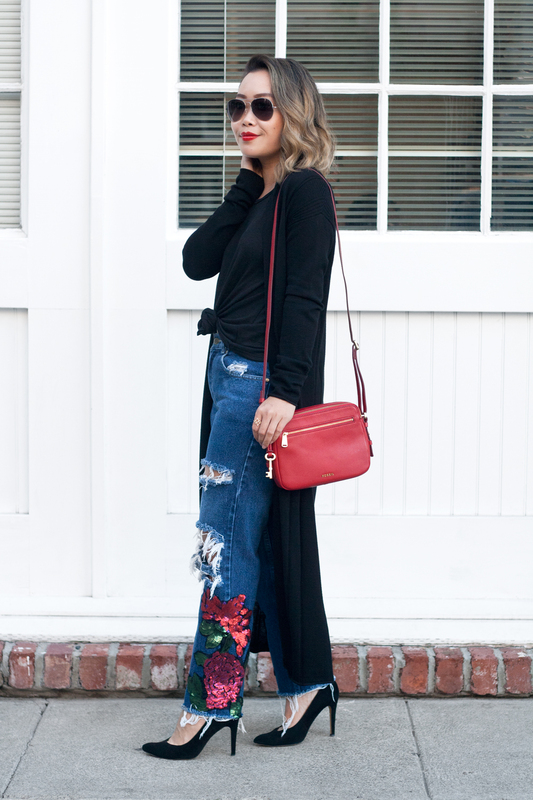 Red mini tassel bag by Sondra Roberts. I feel like the past month or so was a whirlwind... Just five more days until Christmas!!! Can you believe that? And as you can tell, I am slowly wearing more and more red. 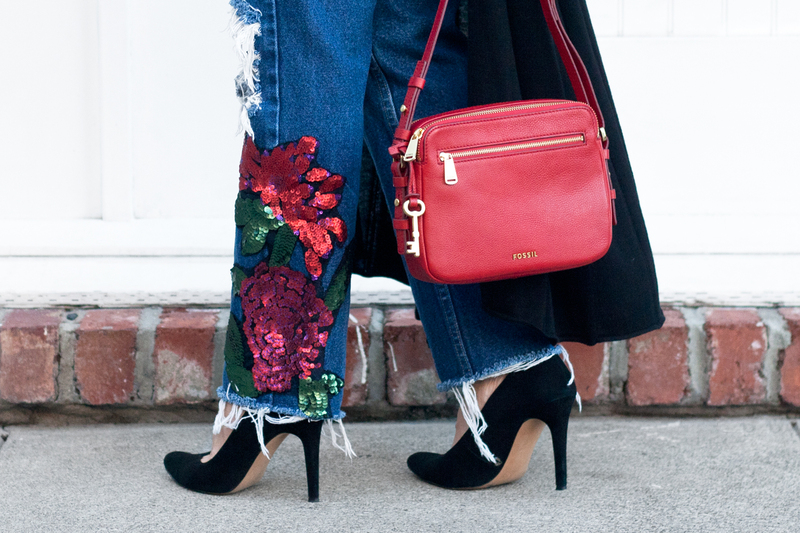 These jeans are absolutely to-die-for! 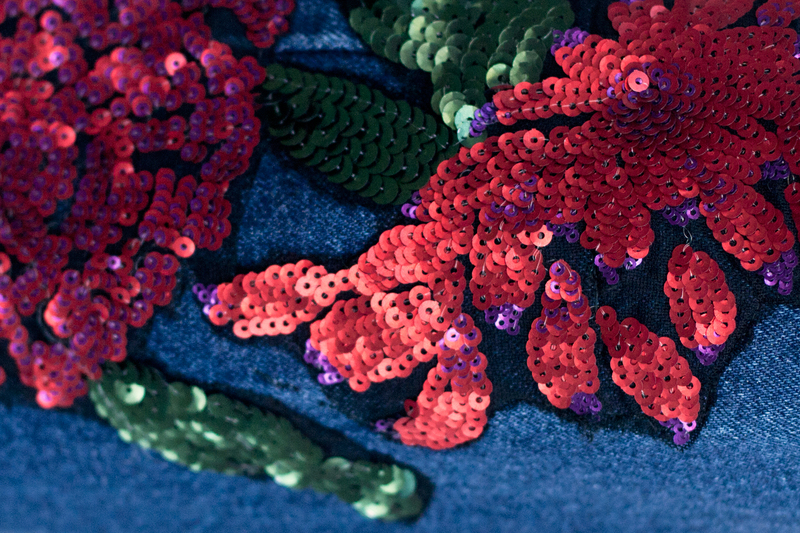 They are vintage denim, distressed, and then bedazzled with this gorgeous sequined floral. They are custom-made by my coworker/friend Nikki whose Rock Bottoms are filled with one of a kind denim. I styled them with a black tank by Free People, long knit cardigan by Max Studio, simple suede pumps by Sole Society and a darling red handbag by Fossil. I am sooo ready for the holiday, and most importantly, the vacation! 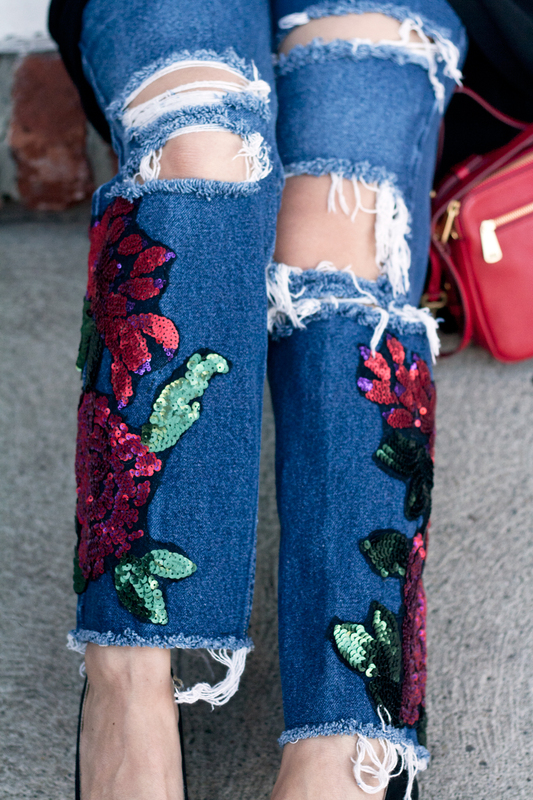 DIY sequined ripped jeans c/o Rocked Bottoms. Piper toaster leather bag c/o Fossil. Long knit cardigan by Max Studio. Racer tank by Free People. Suede pumps (old) c/o Sole Society. I am slowly wearing more and more red as December goes by... You know, just trying to stay cozy and casual while feeling the holiday spirit. 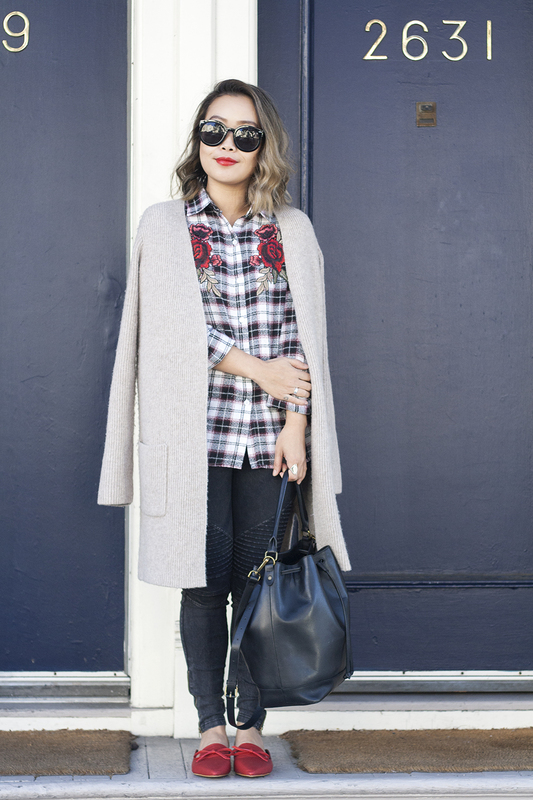 I love a good plaid flannel, even more so when there is floral embroidery on it! 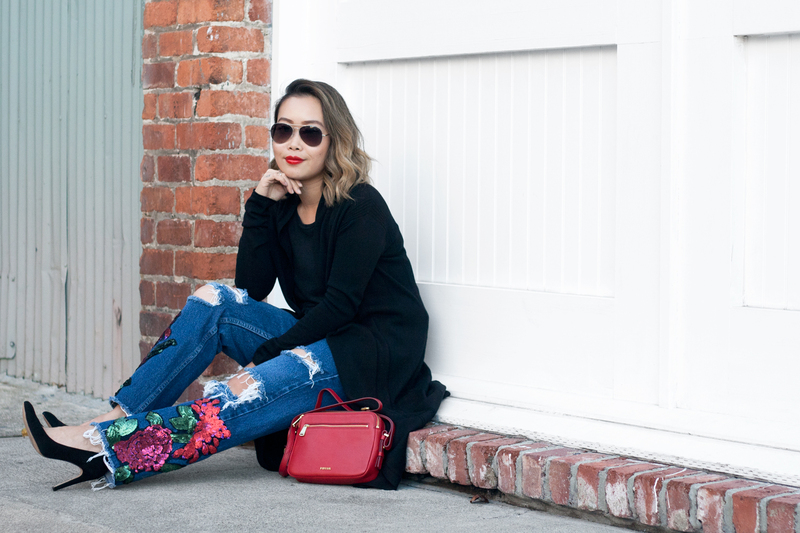 I paired it with denim, a cozy cardigan, leather bucket bag, and these adorable red slides. On a different note, blog posts might be running a bit slow since it has been raining lately and I have been busy. However, I am excited for my upcoming trip to Seattle during Christmas and looking forward to getting tons of content then! 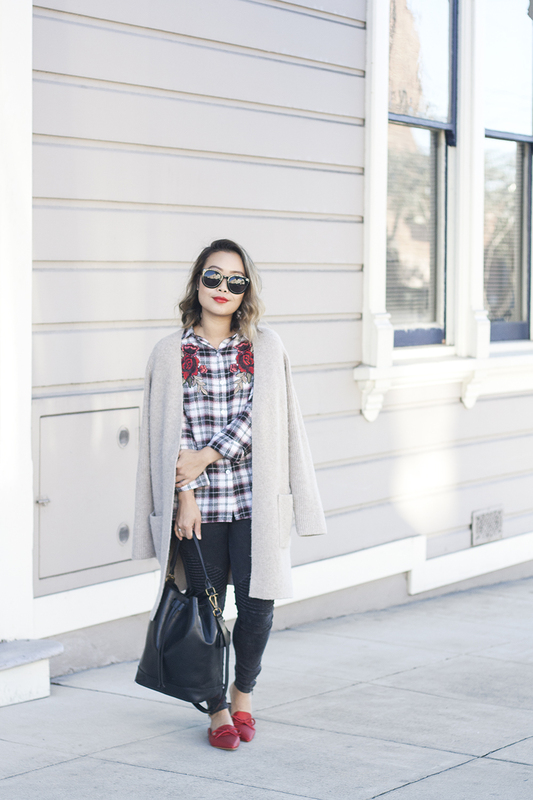 Longline cardigan sweater c/o Madewell. 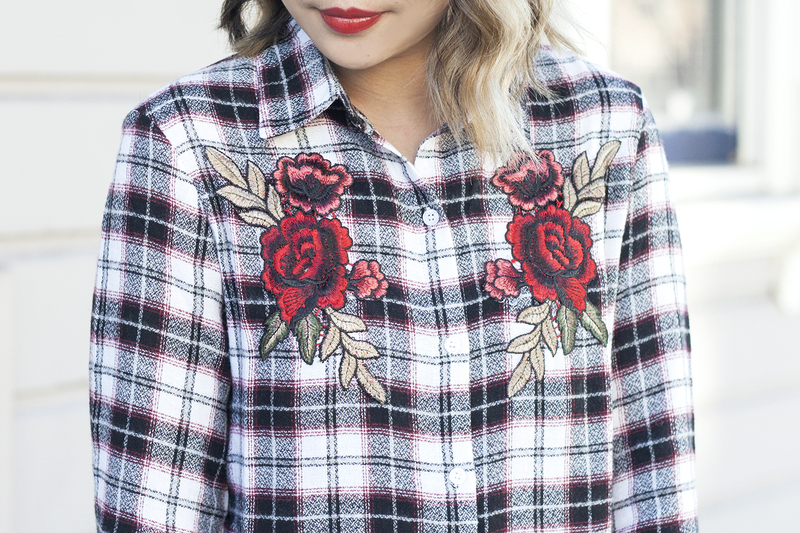 Plaid top with floral embroidery from Boohoo. 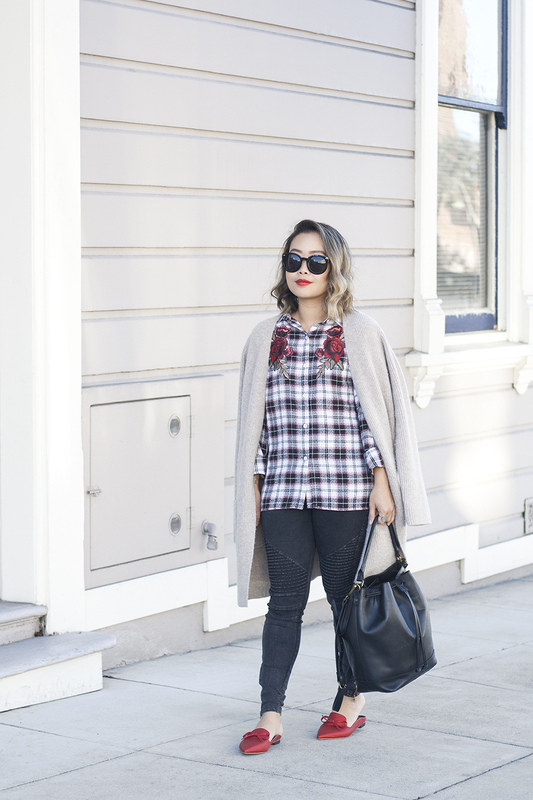 Leather bucket bag c/o Madewell. 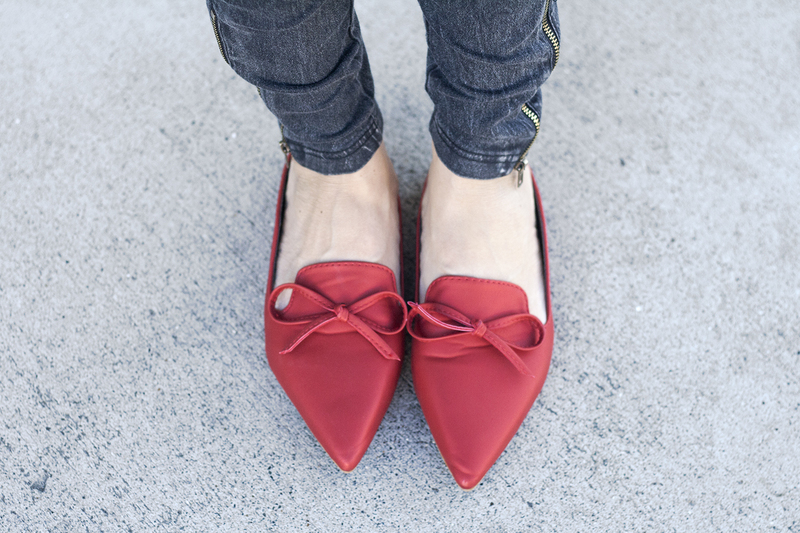 Red bow slides from Romwe. 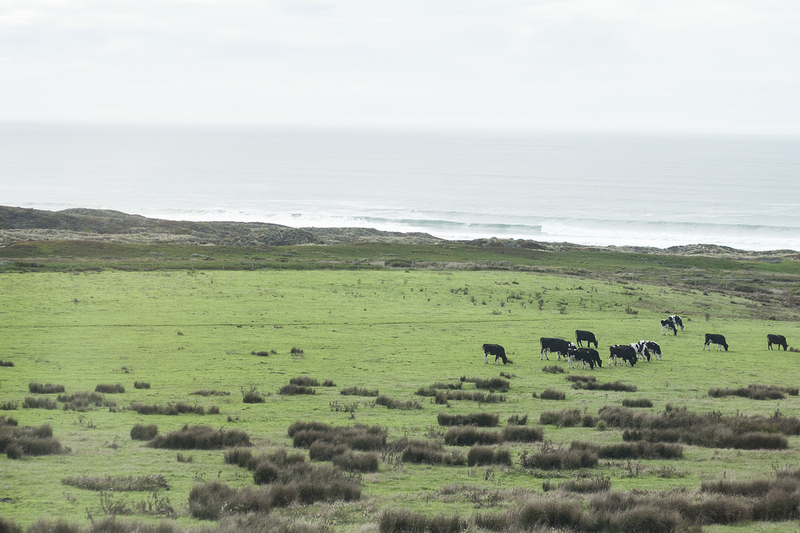 A few weekends ago, I went on a mini adventure to Point Reyes with my friend Holly. I have been to that lighthouse ages ago (ok, more like 15 years ago to be exact) but never checked out the infamous shipwreck or the cypress tree tunnel. So, we went to all three spots! 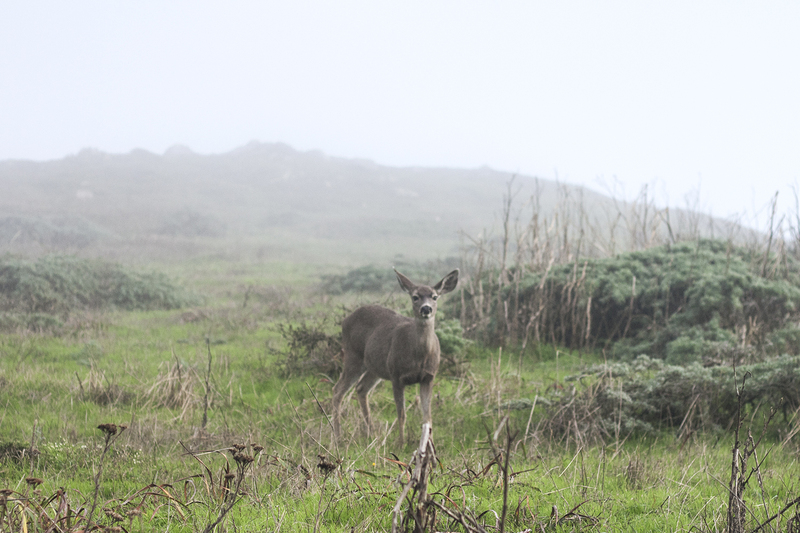 The weather was mostly overcast and foggy which was perfect for photo purposes. And of course, a great adventure must pair with a great outfit! 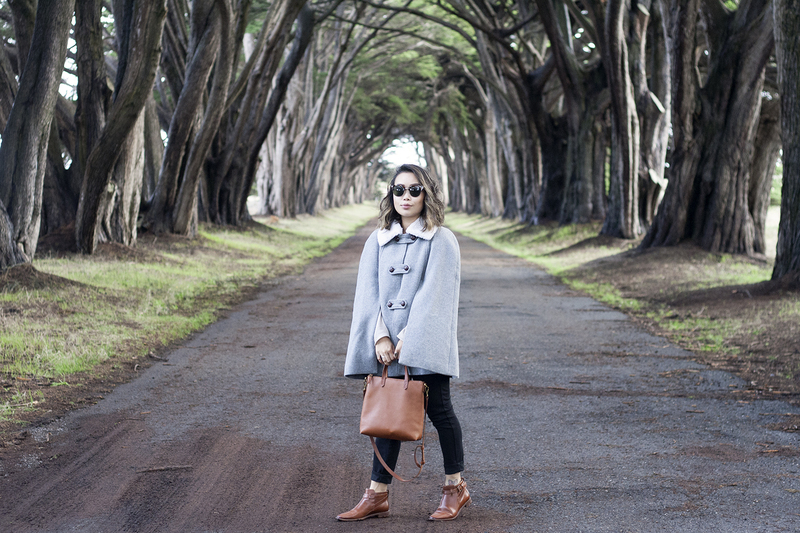 I am wearing Madewell from head to toe (minus the Uniqlo pants)... Sézane wool cape, Hollis leather buckled booties and leather mini crossbody bag. 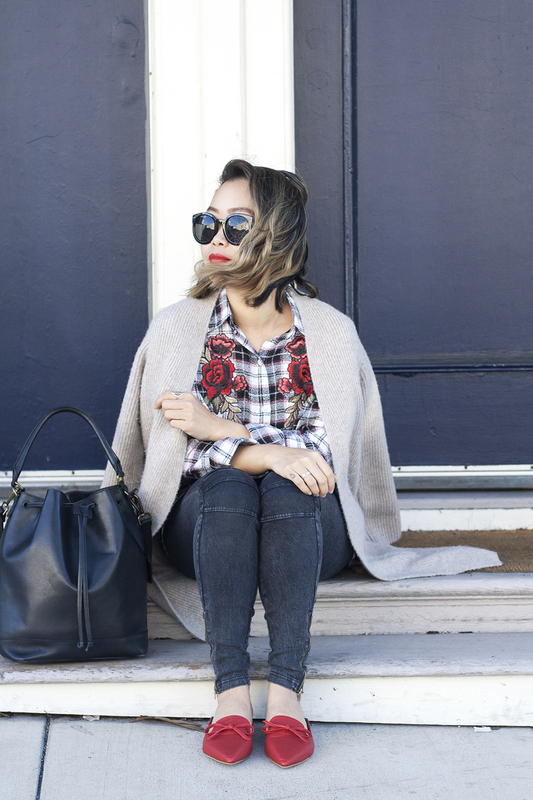 Igor wool cape by Sézane c/o Madewell. 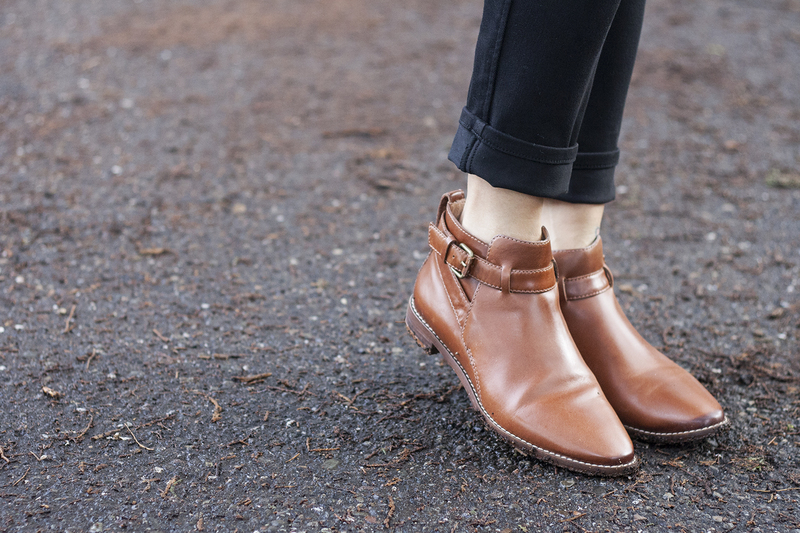 Hollis leather buckled booties c/o Madewell. 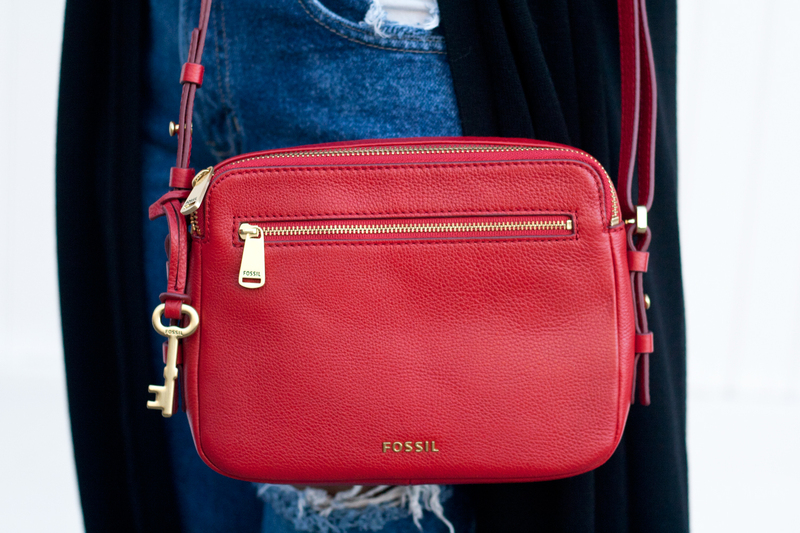 Mini transport crossbody bag c/o Madewell.